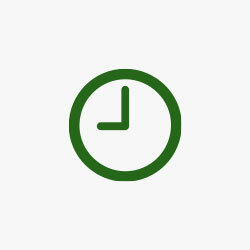 Despite the fact that smartphone and hardware manufacturers are pushing towards a wire-free utopia, we’re still no closer to ridding ourselves of pesky accessories, pens, earphones and other paraphernalia our smartphones seem to crave. Let’s face it, you don’t always want to carry around a huge backpack or messenger bag. And even when you do, you don’t want to have all your loose gear rattling around inside. Waterfield Designs is a brand well known by bag aficionados, and one which has earned my attention and affection over the years. The Gear Pouch does nothing but make my appreciation for their wares stronger. Available in three sizes, the Gear Pouch has been around for some time now, but has been recently redesigned. Whether you want small, medium or large, the Gear Pouch aims to carry around the gadgets you can’t — or don’t want to — fit in your pocket. And it’s super versatile too. 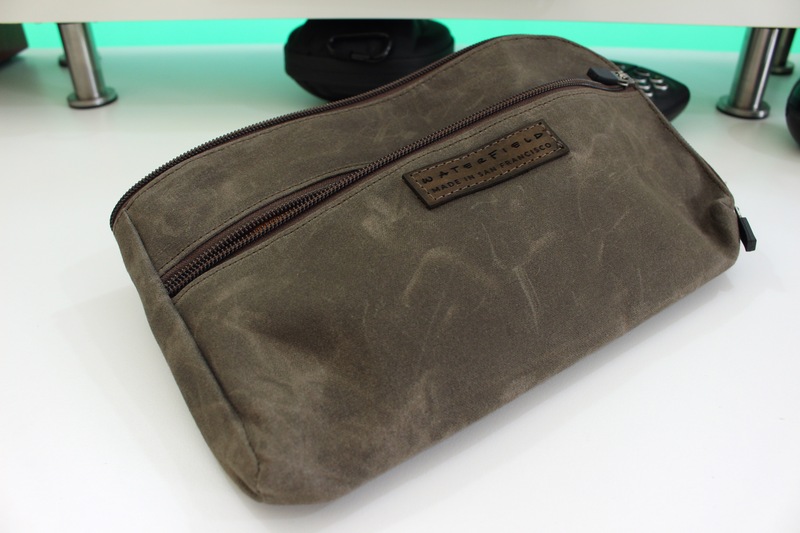 The outside of the pouch is made from a durable, authentic and attractive waxed canvas. It has an aged look, without looking worn, a winner in my book. It has two zippers. One along the front which — when opened — reveals a pocket on the outside. The second runs all the way along the top edge and around the right hand side, down to the bottom edge. This design ensures the pouch can open wide, giving you easy access to all your wires, headphones, cash or whatever else you’ve stored inside. Both the main internal compartment and outside pocket are lined with a shiny, golden amber canvas with a honeycomb pattern stitched in to it. I got to try both the small and medium sized pouches. The former features two internal pockets inside the main compartment, spanning the width of the case. 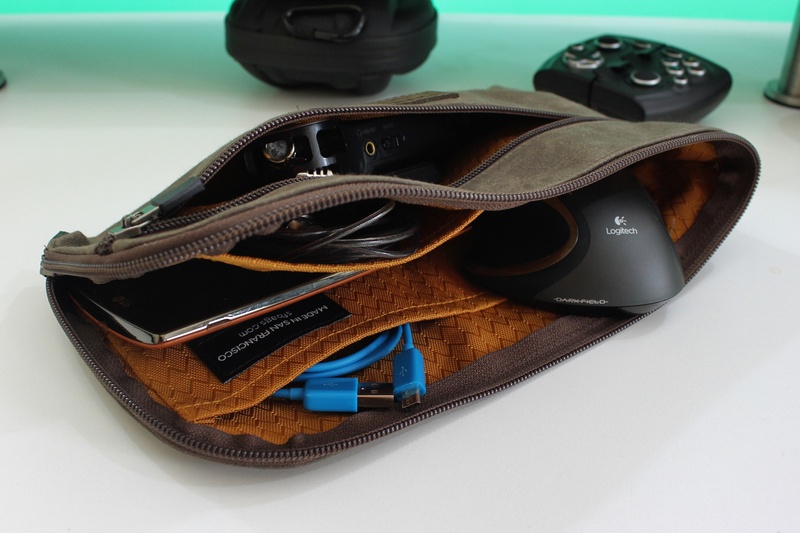 The medium-sized pouch features four internal pockets of similar design. To give you an idea of size, the small gear pouch was plenty capable enough of storing my Nexus 6 (one of the biggest phones around) along with some keys, loose change and an asthma inhaler. For context, those are pretty much my required accessories for going to football practice on a Wednesday night. The medium sized is probably about the right size for a smaller tablet, like the Nexus 7 or iPad mini. The large could fit in an entire Apple Wireless keyboard. So it really depends what you envision needing to carry around as to which model you choose to go for. It’s virtually impossible to limit what kind of gear you want to carry with you. If — like me — you prefer using a mouse to the trackpad on a laptop, you could easily carry a portable mouse, alongside your phone, some USB cables, earphones, cards, cash and keys in one of these. 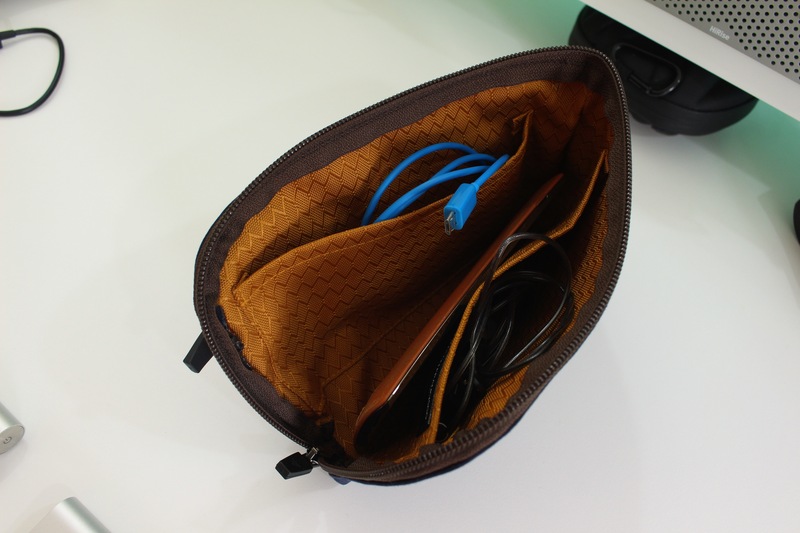 The other option, equally useful for gadget fiends, is being able to carry every single cable you could possibly need in a single pouch to save cluttering up a bag. The other potential downside: Price. Like most of the San Franciscan company’s products, even small gear pouches like this are relatively pricey. The smallest version will set you back $39, while the medium and large are $45 and $49 respectively. They’re available to order now from SFBags.com and come in Navy, Burgundy, Ballistic Black and Brown. We featured the navy and brown versions in this review. It’s hard to over-criticize the Gear Pouch. It’s a really well-made, good looking pouch that will carry almost anything I need to have with me at any given time. In a world of skinny jeans and bending, gigantic phones, it’s good to have something other than a pocket or two to carry my precious gadgets in.